In today’s fast-paced, fast-food world, few of us eat right every day, causing our nutritional needs to take a back seat to other daily concerns. Although taking a quality multi vitamin-mineral supplement can act as a nutritional insurance policy to help you get the nutrition your body requires, our bodies need much more than just vitamins and minerals. Scientists continue to uncover the health benefits of different nutrient components found naturally in food, such as antioxidants, enzymes, prebiotics, probiotics and other phytonutrients. Using a nutritional product that provides all these core nutrition needs is essential to optimizing health, vitality, and longevity. Core Health Pack not only provides a balanced formulation of 21 essential vitamins and minerals, but combines this with natural phytonutrients and antioxidants to help you meet the recommended daily nutritional values. This proprietary formula provides patented amino acid chelated minerals to ensure maximum utilization, combined with potent levels of all the whole food vitamins needed to sustain good health. It also includes high levels of cutting-edge antioxidants, enzymes, probiotics and prebiotics to ensure your body receives all the core nutrients required for ideal health. Core Health’s proprietary fruit blend includes the world’s most concentrated natural sources of vitamin C and antioxidants including acerola cherry, camu camu, citrus bioflavanoids, and a proprietary blend of berries (VitaBerry Plus). The berries alone boast an ORAC value of 6000 ORAC units/gram and specific, guaranteed polyphenol levels in a well-rounded robust blend that sets a new industry standard. Core Health’s proprietary vegetable blend features a variety of nutrient-dense vegetables combined with the proprietary VitaVeggie™ blend. This blend is standardized for specific key nutrients known for their unique health benefits. Anthocyanins, lycopene, lutein, chlorogenic acid, beta-carotene, ellagic acid, quercetin, glucosinolate, sulphorophane and quinic acid are all found in VitaVeggie™ to ensure you get all the important nutrients nature intended from these vegetables. Core Health Pack’s antioxidant blend provides powerful antioxidants from pine bark extract and mixed tocopherols, combined with the power of resveratrol and quercetin. Then ensures your body is able to produce its own powerful antioxidant enzyme (SOD) by including a patented Superoxide Dismutase (SOD) Precursor System. The Core Health digestive enzyme blend includes high levels of proteases from a proprietary blend specially designed to maximize the utilization of protein, and a concentrated blend of various lipases to maximize the digestion and utilization of fats for energy. This unique blend of enzymes not only supports healthy digestion, but also promotes full utilization of the nutrients in the foods you eat to help maximize your energy levels and help you get the most out of each meal. The Core Health prebiotic and herbal support blend takes the prebiotic benefits of inulin a step further by combining them with a patented, stabilized form of glutamine (magnesium glycyl glutamine) and the naturally soothing benefits of ginger, peppermint, beet root and chamomile. This unique combination addresses all aspects of a healthy intestinal tract. The Core Health Pack is guaranteed to supply invaluable nutrition and promote optimal functioning of the core systems in the body. 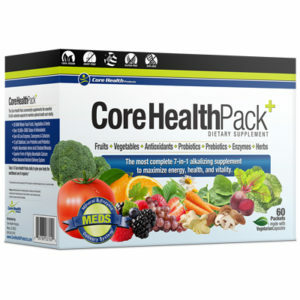 The natural ingredients in Core Health Pack promote healthy functioning of the digestive, cardiovascular, metabolic, immune, skeletal, and brain functions of the body. Your body deserves the best nutrition it can get, and that is precisely what the Core Health Pack delivers!